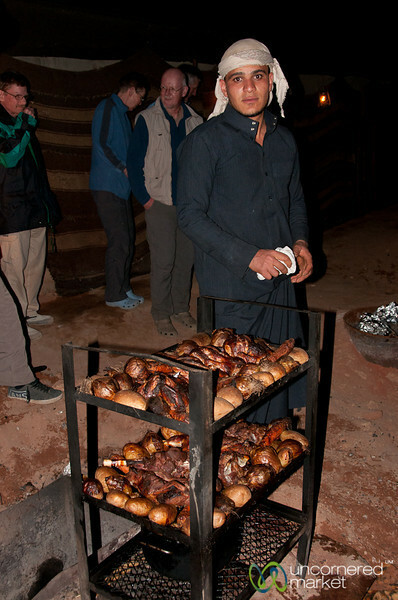 Zarb is like Bedouin barbecue - a large pit is dug in the ground and a fire is made. When the fire is good and hot and has become hot charcoal, the meat and vegetables are placed in trays above it. Then, the whole area is covered with protective cloth or foil and sand is piled on top to be sure that no heat escapes. Here you see the final product - a large tray of meet, chicken and vegetables fresh from the zarb pit. Taken at Captain's in Wadi Rum, Jordan.